The Republic of Latvia is located in northeastern Europe, nestled between Lithuania and Estonia on the eastern shore of the Baltic Sea. Latvia’s picturesque landscape features gently rolling hills and thick forests interspersed with numerous rivers, lakes, and marshes. Ethnic Latvians constitute a slight majority of the population, while Russians make up the largest minority group. In the Latvian language the country’s full name is Latvijas Republika. Rīga is Latvia’s capital and largest city, as well as its chief port. The country covers an area of about 63,700 km². Beginning in the 13th century, Latvia was successively dominated by Germany, Poland, and Russia. Latvia became an independent country in 1918, as did its neighbors Estonia and Lithuania. The three countries became known as the Baltic states. In 1940 the Union of Soviet Socialist Republics forcibly annexed the Baltic states. 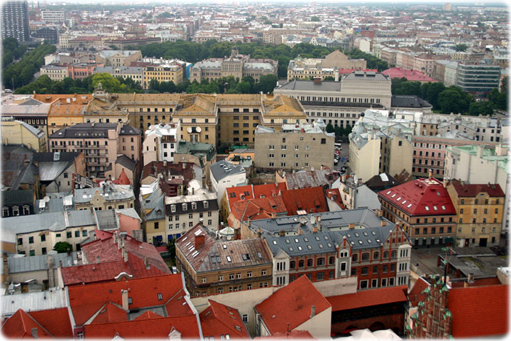 Latvia regained its independence in 1991 and reinstated a parliamentary democracy. The country transformed its economy as well, rapidly dismantling the centralized system of the Soviet period in favor of a Western-style, free-market economy. Latvia’s success in implementing these reforms helped it gain full membership in the European Union in 2004. Partial view of Riga, the capital of Latvia, located on the Daugava River, near its mouth on the Gulf of Rīga, an arm of the Baltic Sea (photo Gunta Klavina).